This recipe is an adaptation of the "Simple Sugar Cookies" in the King Arthur Flour Baker's Companion, one of the few presents I requested from my husband this year. I was mostly interested in the breads and other yeasted baked goods, but was happy to discover a cookie recipe without eggs. I've changed it both to accommodate dairy allergies and to make it softer and chewier, the way a good sugar cookie ought to be. The best part is that I finally have the classic sugar cookie I have always loved and can finally share with my son. Mix soymilk and lemon juice in a nonreactive container, i.e. Pyrex measuring cup, and set aside. Preheat oven to 350°. Line two standard cookie sheets with parchment paper. Sift dry ingredients together in a small bowl and set aside. Cream margarine and sugar together in a mixing bowl until fluffy. Add soymilk mixture and vanilla, then beat until combined. (Don't worry if it develops a cottage cheese texture.) Continue to beat while gradually adding the flour mixture until completely combined. Drop two tablespoonfuls of dough for each cookie two inches apart on the cookie sheets. The King Arthur recipe recommended dipping a glass in sugar and using it to press down on the cookies. Unfortunately, the sugar didn't adhere to the glass bottom and wasn't transferred. 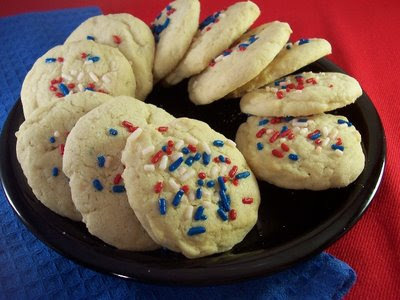 So I simply sprinkled each cookie with granulated sugar, then used my fingers to flatten the tops, so that The Kid could enthusiastically apply red, white, and blue sprinkles. (I didn't want the cookies to be too thin and crispy, so I didn't press them down very far.) Next time I'll just shape the dough into balls, then roll in sugar and press down with a glass. Bake the cookies for 14 to 16 minutes. After removing from oven, carefully slide a wire rack underneath the parchment paper, and allow the cookies to cool on the rack. Makes 1 1/2 dozen soft and chewy cookies. These cookies are being sent to Rachel at Vampituity for January's Childhood Delights themed Sugar High Friday. I am taking a little liberty (teehee) with the subject, since she called for recreations and stories of food bloggers own childhood favorites. Instead, I am creating a new tradition from an old favorite with my son, who seizes any and all opportunities to celebrate in the kitchen. With sprinkles. Great looking cookies! I've had a problem with eggless sugar cookies tasting too much of baking powder. I have to give these a try soon. Those are just gorgeous! What a great idea. What a great site! Thanks for sharing your recipes with all of us! Political, celebratory, vegan delights- thank you for sharing the creation of your own new tradition with these! They look awesome and insprire the bakers in all of us to boldly brave the vegan waters to discover whole new worlds possible. Thank you for forging this new path on a simple delight for Childhood Delights SHF!